Target cost per acquisition (CPA) is a flexible bidding strategy in your AdWords account. It’s one of many flexible bidding strategies that Google has released in the last few years. For people new to Google AdWords or Paid Search, it’s a feature that’s best left untouched. However, if you have experience in using AdWords and have an account with a tight CPA goal, then giving target CPA bidding a chance is worth it. AdWords target CPA allows an advertiser to set how much they want to pay per conversion. Google will give you a recommended target CPA on what it believes is a sensible conversion cost given historical cost-per-clicks and click-conversion rates. You can’t just jump into Target CPA bidding in your first week of opening an AdWords account. You need conversion tracking enabled with a minimum of 15 conversions in the last 30 days. As with most things, the more conversion data you have, the better Google can manage your CPA goal. Increasing or decreasing your target CPA bid will affect the number of conversions you’ll receive. As a general rule of thumb—the lower your CPA target, the fewer conversions you’ll receive; the higher the CPA target, the more conversions. If your account goals rely on a certain percentage for return on ad spend (ROAS), then lowering the number of conversions isn’t necessarily a bad thing as long as that ROAS is there. It’s likely a conversation you’re going to need to have with the client. You’ll need to note the drop in sales but highlight the increase in profitability. If you’re limited on a budget for a campaign that has target CPA bidding implemented and you want to maintain the number of conversions with the higher ROAS benefits, just try walking the budget higher. I don’t typically make dramatic jumps in campaign budgets where I’m testing a new bidding strategy—there’s too much uncertainty in that. Instead, I make incremental increases until the campaign is no longer limited by budget. If ROAS drops as daily budget increases, I walk it back down, get to the source of the problem, optimize it, and try walking it back up again. Rinse and repeat as necessary until the campaign is no longer limited by budget. The shared library area of AdWords is where these strategies should be created. While you can do it on a campaign by campaign basis under the settings tab, it’s harder to track the status of the bid strategy that way and is much more time to consume to scale. From the shared library, you can see how well the flexible bidding strategy is working. Here’s a screen shot from my $9 CPA target goal after I customized my columns. As you can see, the algorithmic bidding of the target CPA bidding strategy has been pretty close to the target goal of $9/CPA. On a day to day basis the cost per acquisition fluctuates but over time it evens out to around $9. Here’s a view of the daily fluctuations in CPA within the shared library. The difference between setting up CPA bidding in settings and in the shared library is the ability to track progress. In one of my accounts, I have multiple CPA targets depending on product type. With that in mind I created multiple CPA bidding campaigns in the shared library and added product specific campaigns to the applicable CPA bidding target. Quality score is an overlooked factor when advertisers focus on CPA. There is a direct correlation between quality score and CPA. While it’s obvious when you think about it, it’s not one of the immediate things advertisers do to control CPA. The higher the quality score the less you pay per click. If you can increase your quality score from 5 to 10, that will result in a decrease in cost which results in a decrease in CPA. Quick things you can do to increase your quality score include breaking out your ad groups into more focused keywords and building ads with associated keywords in the headline. Another fix is to change the landing page ad copy to make it more relevant to the targeted keywords. This may include changing your H1 tag and body copy. Changing expected click through rate is slightly more difficult. It may take a while with higher overall account click through rate to make that number budge. Changing your ad to make it more relevant to the targeted keyword and changing your landing page relevance are things under your control. Focus on those and an increase in quality score will follow and so will lower CPA. The client is a B2C E-commerce company that specializes in custom products. Many of the products are under $30 which in a search engine marketers eyes means there are strict CPA goals. Average cost-per-clicks for this account hover around the .50-$1 range. We’ve gradually increased this accounts ad spend while maintaining a strict 300% ROAS goal. We recently broke out average order value by product in Google Analytics and used that information to come up with CPA goals by product type. With that in mind, I tested several of their high traffic campaigns with a $9 CPA target bidding. When you make a dramatic change such as changing from a manual bidding strategy to an automated bidding strategy, you need to keep a close eye on the day to day results to ensure the account doesn’t go off the rails. While many times you won’t have anything to worry about, but if for some reason these changes cause a problem with the account, you need to be on top of it. Why did I target their highest traffic campaigns to implement this test? I enjoy making informed decisions with large amounts of data. If I choose a campaign that doesn’t generate much traffic or sales, then it will take longer to gather enough data to determine the effectiveness of the target CPA bidding. By using the highest traffic campaigns, I can determine the effectiveness in a shorter period of time to make informed decisions on the test. The results of the target CPA bidding were astounding. Cost dropped by 50% and conversion rate doubled. Before implementation, we were spending around $400/day on AdWords with a 5% conversion rate. After implementation, we’re now spending $200/day with a 10% conversion rate. You can see the strict departure from the norm where both cost drops and conversion rate increases. That’s a fun metric to report to your client. These graphs break down data on a weekly basis. Some things to note on these graphs, number of conversions dropped by about a third. With a 50% reduction in cost, this is an expected result. If your goal is to maximize conversions this isn’t the best strategy, but if your goal is to maximize conversions at a target CPA, this may be the best approach. The second graph shows weekly AdWords revenue and returns on ad spend. While revenue has dropped, the cost has dropped more which makes the return on ad spend higher and makes the AdWords account more profitable overall. The click-through-rate (CTR) graph takes into account display and shopping campaigns which lower the overall account CTR. What’s interesting is that when target CPA bidding was implemented, the click through rates has increased by over 50%. This wasn’t something that was expected but obviously welcomed nonetheless. 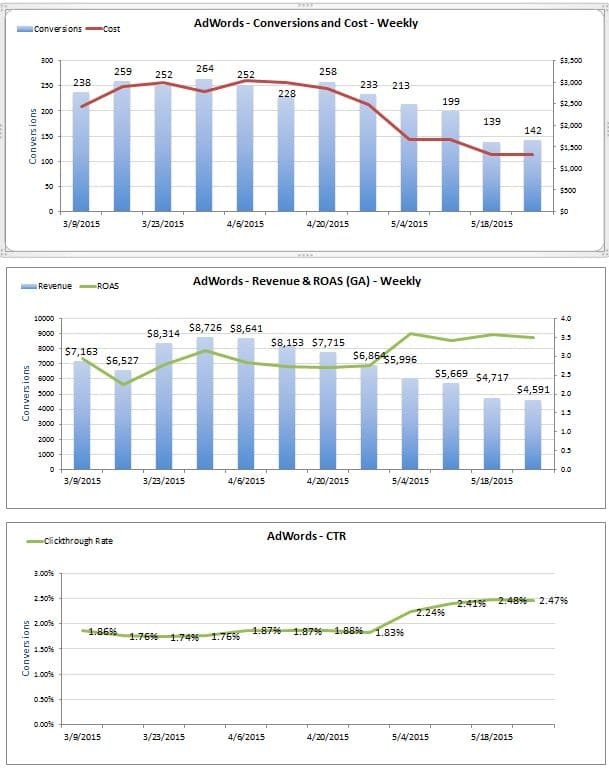 Take note that these graphs show account level and aren’t isolated to the before and afters of only the campaigns in which target CPA bidding was implemented. There are potential problems with target CPA bidding if your account goals are to maximize conversions and revenue without much regard to the cost of those conversions. Enhanced CPC bidding may be more applicable as a flexible bidding strategy for that account goal. Our goal is to maximize conversions at a certain cost. For some campaigns that may be $9 CPA goal, for others it’s a $15 CPA goal but there is always a CPA goal attached to our campaigns in this account. The main action needed after this implementation was to increase conversions at that CPA rate. Increasing daily budgets were applicable and setting different ad group CPA targets. The more granular your CPA targets the better dialed in your account will be with this type of bidding. I’ve expanded the CPA bidding to other campaigns in the account with varying CPA goals to match average order value with a 3x ROAS goal. The account goal in my eyes has shifted from one of hitting CPA targets, which has largely been accomplished to now maximizing conversions while maintaining CPA goals. Maybe I’ll document those efforts in part two of this case study. The results of this case study make me excited about different ways to implement flexible bidding strategies for our clients. It’s a stark contrast between manually bidding and algorithmic bidding in terms of results. There are things that an algorithm can optimize that humans can’t. I can’t look at a user’s search query in real time and decide what to bid based on the likelihood of a sale, but an algorithm can. While one can only target exact match keywords and set manual bids for those, I’d argue that would be a poor strategy that results in the loss of a lot of profitable keywords or is not an efficient use of time. I think the future will reward advertisers who use algorithm based bidding strategies where it makes sense. As long as it’s done properly and watched carefully it makes sense to give it a try as that algorithm will manage things that a human can’t. If you have any experience or thoughts on using flexible or automated bidding strategies, feel free to leave them in the comments. Feel free to contact us for a free customized internet marketing consultation for your business.